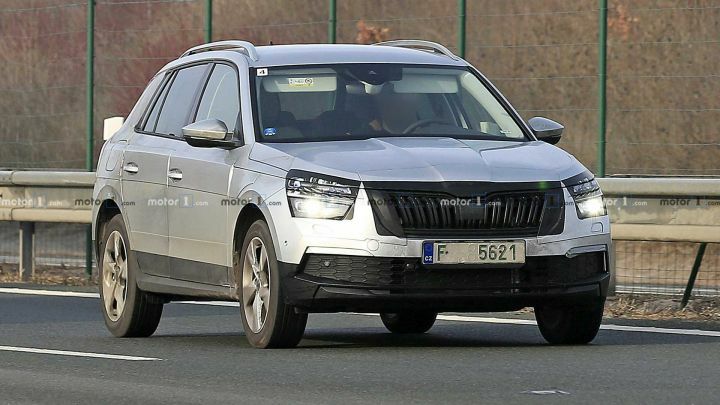 Skoda Kamiq spied testing with camouflage in Czech Republic. To debut at upcoming Geneva Motor Show. Likely to be launched in India at the 2020 Auto Expo. Skoda revealed the first sketches of its upcoming ‘city SUV’ called the Kamiq last month. Now, we have got the first glimpses of how the new compact SUV is shaping up to be thanks to a set of spy pictures. Based on the VW Group’s modular MQB A0 platform, the Kamiq looks a like scaled down version of the Kodiaq, which means it has a more crossover appeal to it rather than a tallboy SUV. Although the unique body-coloured camouflage makes the test mule look disproportionate and unflattering, a closer look reveals familiarity in design with the Skoda Vision X concept from last year. We expect the final design of the Kamiq to be a more watered down version of the concept. Spied in Czech Republic, the test mules are also bigger and larger than the China-only version of the Kamiq that was revealed last year. We are likely to get a version which is much more closer to the Euro-spec model than the one for China. While there is no new info available on the interiors of the Kamiq from the spy shots, Skoda has already revealed that the interiors will be carried over from the Scala hatchback, the first MQB A0 car from Skoda. The Kamiq gets the same interior as the Scala, albeit without the wooden finish. It also misses out on the flat-bottom steering wheel seen on the hatchback. The 10.25-inch Virtual Cockpit digital instrument panel along with a 9.2-inch infotainment display will occupy most of the space on the dash, giving the cabin a premium appeal. While there is no official information regarding the powertrains yet, the Kamiq could get the 2.0-litre TDI diesel motor along with the 1.4-litre TSI petrol option in India. We expect it to be offered with both manual and automatic variants as well. The Kamiq is set to be unveiled at the Geneva Motor Show that kicks off on March 5. The SUV is likely to make it to our shores as early as next year, with a debut at the 2020 Auto Expo. With MQB A0 platform being currently localised in India, the SUV will take on established rivals such as the Hyundai Creta and the Renault Duster. With its premium appeal, it will also face stiff competition from the likes of the Tata Harrier, Nissan Kicks and Jeep Compass in India.